The Honolulu Museum of Art’s new spring benefit truly marries art and food. Happening April 6, Palette features 10 dishes by five chefs who were inspired by works from the museum’s collection. The event features chefs Kevin Lee of Pai, HoMA chef Robert Paik, Wade Ueoka and Michelle Karr-Ueoka of MW Restaurant and Lee Anne Wong of Kokohead Café. We invited them to wander the museum or browse a selection of images of artworks and select one on which to base a trio of dishes—two small bites and one full plated course. And we’ve talked to all of them about their art choices and the resulting food they created. 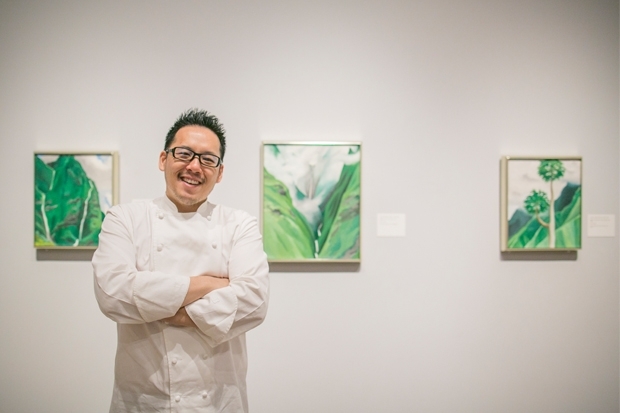 Paik, who was previously at the short-lived Avenue’s and Vintage Cave, can often be found exploring the museum (you can see his chef’s-eye view of HoMA on his Instagram account @robertpaik). For Palette, he looked for artwork that evoked spring and homed in on the lush greens of Georgia O’Keeffe’s trio of Maui landscapes hanging in the Modernism Gallery, especially Waterfall—No. III—Iao Valley. 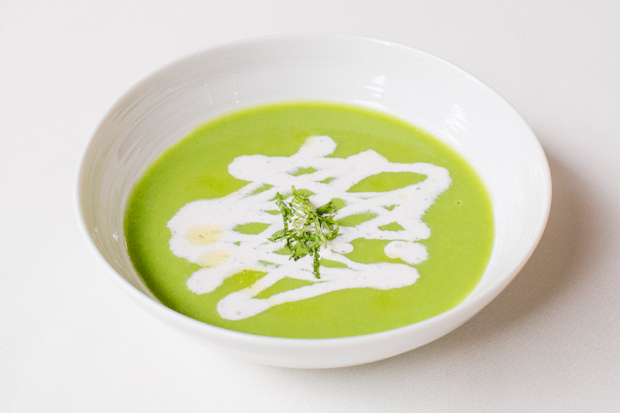 “When I look at it, because I think about food so much, I go, ‘Oh wow, it reminds me of a pea soup with crème fraiche,’” which is exactly what he is making, the crème fraiche drizzled like the painting’s white waterfall lines. There are different experiences to be had at Palette, which offers individual tickets for $200 and tables for $1,500 (these are sold out), $5,000, $7,500 and $10,000. Five stations in Central Courtyard will each serve two different bite-size dishes. Individual ticket holders can sample them all, along with cocktail pairings. In addition, all galleries will be open and guests can hear museum curators talking about the artworks that inspired the food. Palette: April 6, 6-9pm. See event details and purchase tickets online. Next week: We reveal Lee Anne Wong’s art pick and the dish it inspired.